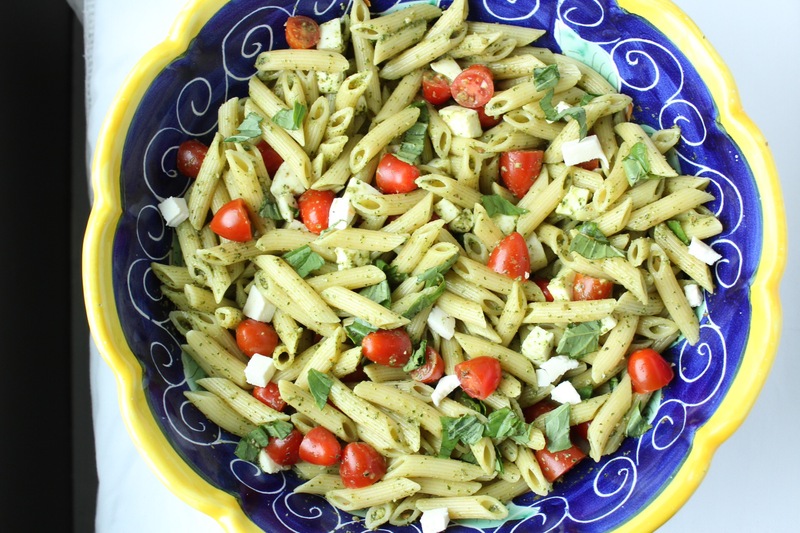 Monday – Pesto pasta with fresh mozzarella and cherry tomatoes. This recipe is so easy and is a perfect dinner for busy nights! Pesto is a great sauce to keep on hand. You can either buy it from the store or make ahead of time and freeze it! Click here for my pesto recipe] I use almonds instead of pine nuts because they are more affordable! 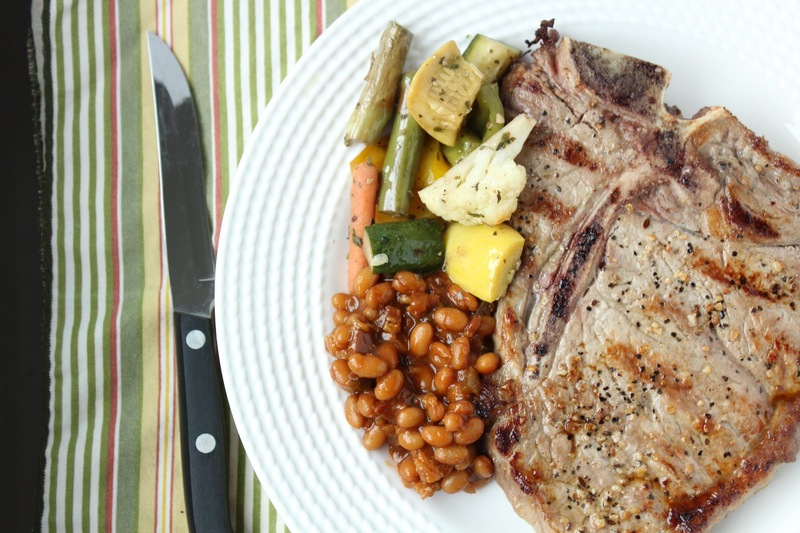 Tuesday – T-bone steak with roasted vegetables and beans. This is why I don’t let me husband do the food shopping. T-bone steaks, despite not being on the grocery list, somehow made it into the shopping cart! But I have to give him credit, they tasted great! 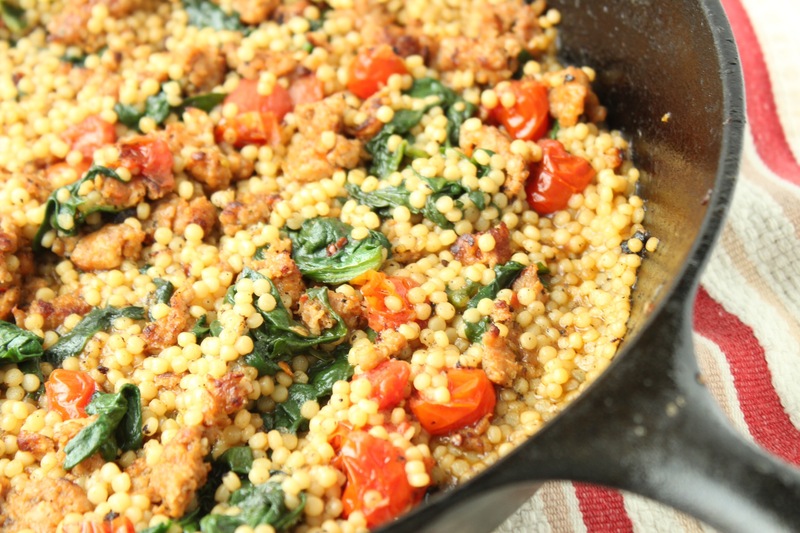 Wednesday – Acini de Pepe with spicy sausage, cherry tomatoes, and spinach. A one pot dinner…Woohoo! Heat olive oil over large cast iron skillet. Add sausage and cook until brown, about 5-7 minutes, stirring frequently. Set aside. Add 1/2 cup acini de Pepe and 2 1/2 cups of water. Bring to a boil, then lower heat to medium-low and cook until all water has absorbed, about 10 minutes, sitting constantly. 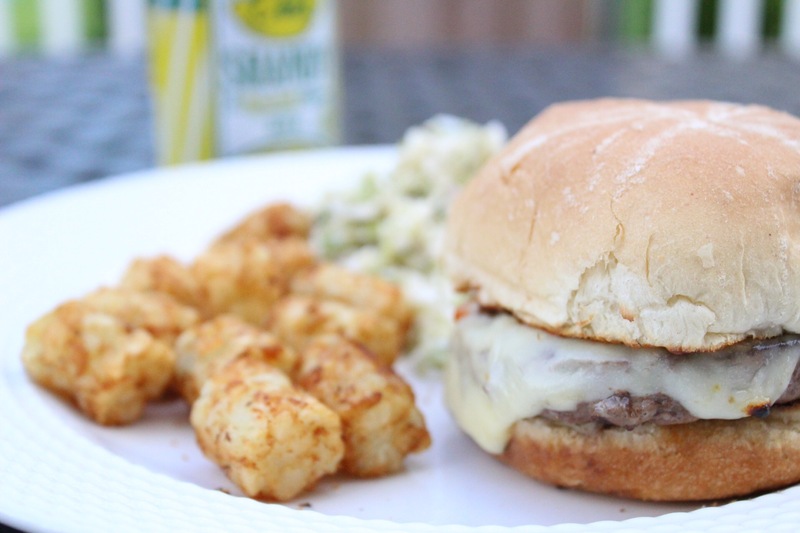 Thursday – Cheeseburgers with coleslaw and tator tots! You don’t always need a fancy dinner, and sometimes tator tots just call your name! 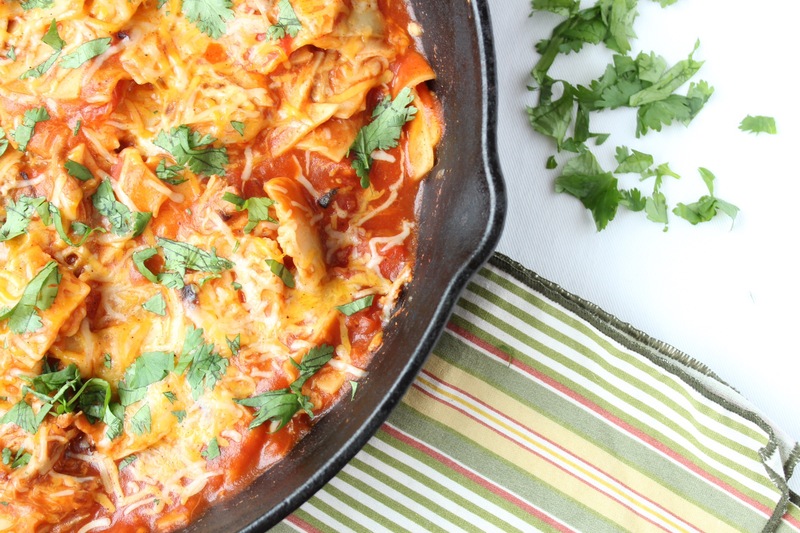 Friday – Pork enchilada skillet dinner. Happy Cinco de Mayo! Celebrate with this one pot meal! 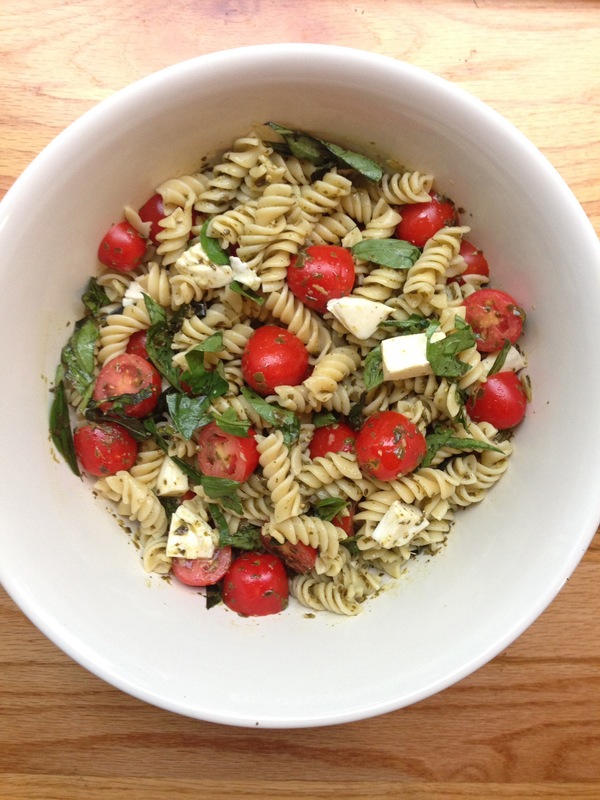 Pesto, mozzarella, and cherry tomatoes are the perfect trio. Mixed together and served over pasta is the perfect summer dinner! Last year I shared my love for simple and easy dinners. In case you missed it, click here to read about my 12 easy dinner ideas. Having quick meals, meaning easy prep and easy clean up, leaves you with more time to enjoy your summer! This dish is perfect because all it calls for is one knife, one cutting board, and one pot! I made my pesto ahead of time. To read my pesto recipe, click here. I said my New Year’s Resolution was to post more, so far that has been a big fail! I’m about 6 weeks away from the baby’s due date, so instead of a weekly meal planning post, I’m offering a single meal dish of my dinner tonight. As I sat down to eat, I had this sudden urge to take a picture of this dish and share it with my blog! This pasta dish is on the lighter side; it’s creamy, but has no heavy cream in it. Instead the creamy consistency comes from greek yogurt! The inspiration for this recipe can be found here. Cook pasta according to the package directions. Before draining, place spinach at the bottom of the strainer and drain pasta over spinach, allowing it to wilt. Cook chicken sausage in 1 tbsp butter or olive oil over medium heat for 12-14 minutes. Add garlic and cook for another 30 seconds. Remove from heat and place cooked sausage onto cutting board. Slice into bite size pieces. 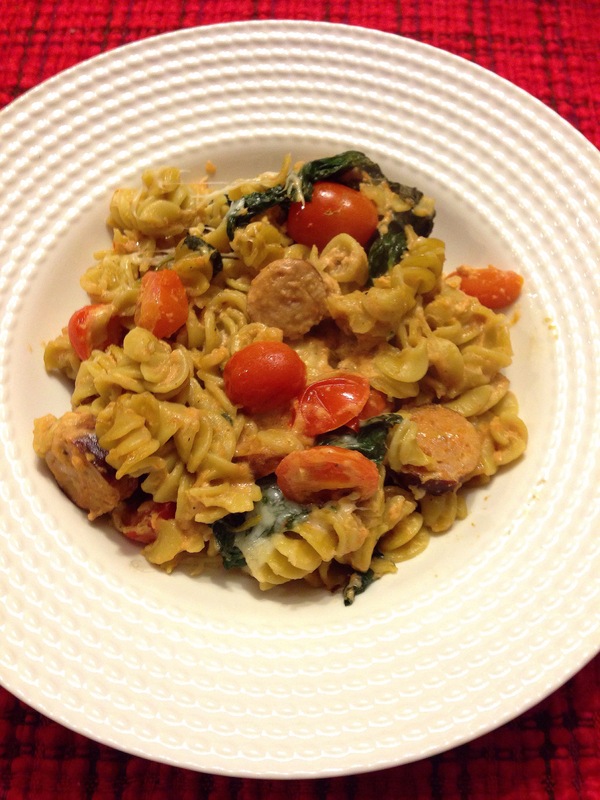 Add garlic pieces to a large bowl, add the cooked pasta, sausage, spinach, and tomatoes. Then add tomato sauce, yogurt, milk, 1 cup of cheese, and spices. Mix very well. Pour into casserole dish. Top with remaining cheese. Cover with foil.